Woods Hole Oceanographic Institution operates the U.S. Navy-owned Deep Submergence Vehicle Alvin for the oceanographic research community. Built in 1964 as the world’s first deep-ocean submersible, Alvin has made more than 4,200 dives and can reach nearly 63 percent of the global ocean floor. The sub’s most famous exploits include locating a lost hydrogen bomb in the Mediterranean Sea in 1966, exploring the first known hydrothermal vent sites in the 1970s, and surveying the wreck of RMS Titanic in 1986. 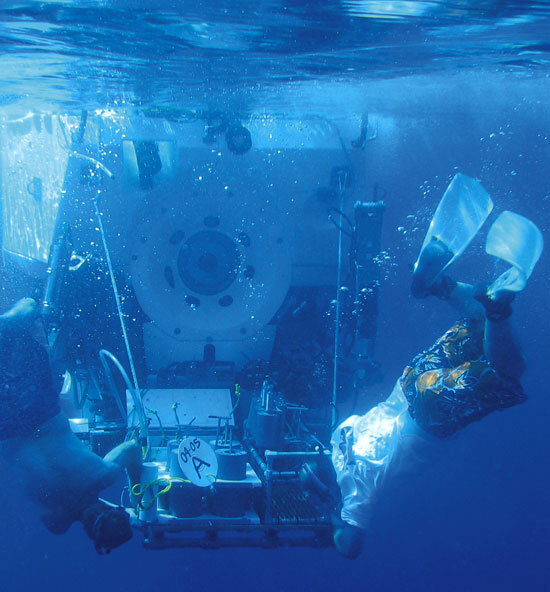 Part of the U.S. National Deep Submergence Facility, Alvin carries two scientists and a pilot as deep as 4,500 meters (about three miles) and each dive lasts six to ten hours. Using six reversible thrusters, Alvin can hover, maneuver in rugged topography, or rest on the sea floor. Diving and surfacing is done by simple gravity and buoyancywater ballast and expendable steel weights sink the sub, and that extra weight is dropped when the researchers need to rise to the surface. The sub is equipped with still and video cameras, and scientists can view the environment through three 30-centimeter (12-inch) viewports. Because there is no light in the deep, the submersible must carry quartz iodide and metal halide lights to illuminate the seafloor. Alvin has two robotic arms that can manipulate instruments, and its basket can carry up to 680 kilograms (1,500 pounds) of tools and seafloor samples. Through numerous reconstructions and upgrades made over the years, Alvin remains state-of-the-art. (For instance, a new robotic arm was installed in 2006.) The sub is completely disassembled every three to five years so engineers can inspect every last bolt, filter, pump, valve, circuit, tube, wire, light, and batteryall of which have been replaced at least once in the sub’s lifetime. The sub is named for Allyn Vine, a WHOI engineer and geophysicist who helped pioneer deep submergence research and technology. 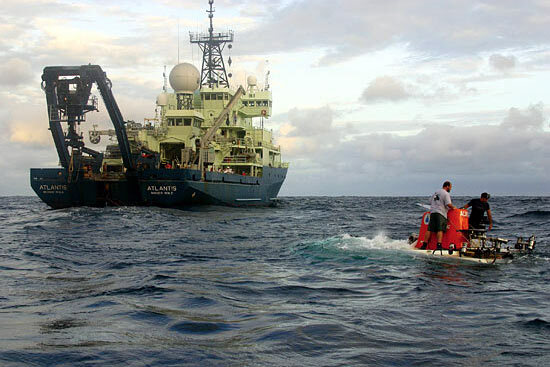 The research vessel (R/V) Atlantis is owned by the U.S. Navy and operated by the Woods Hole Oceanographic Institution for the global oceanographic community. It is one of the most sophisticated research vessels afloat, and it is the only ship specifically outfitted for launching and servicing the Alvin human occupied submersible. Delivered to Woods Hole in April 1997, Atlantis was built with six science labs and storage spaces, precision navigation systems, seafloor mapping sonar, and satellite communications. The ship’s three winches, three cranes, machine shop, and specialized hangars were specifically designed to support Alvin and other vehicles of the U.S. National Deep Submergence Facility. The ship carries a complement of 38 crew members, science technicians, deep submergence group members, as well as a scientific party of 24 men and women for as long as 60 days. 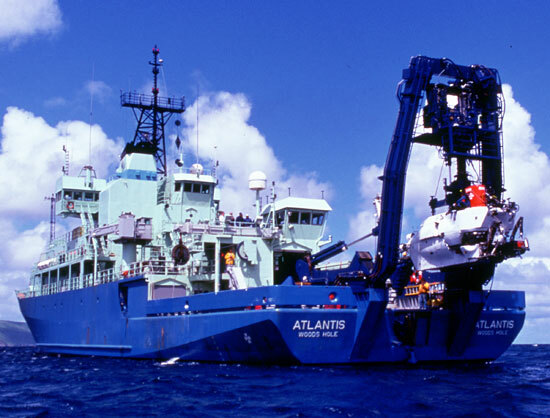 Because Atlantis is constantly going where Alvin is needed for exploration, the ship operates in all of the world’s oceans and is rarely seen in Woods Hole. In recent years, the ship and sub have spent most of their time exploring underwater volcanoes and hydrothermal vents in the Pacific Ocean. Atlantis is the namesake of WHOI’s first research vessel, a 142-foot, steel-hulled, ketch-rigged ship that sailed 299 cruises and more than 700,000 miles for ocean science from 1931 to 1966. The Institution’s flagship and symbol was the first American ship built specifically for research in marine biology, marine geology, and physical oceanography. The space shuttle Atlantiswhich will visit the International Space Station again in March--was named for the original WHOI research vessel.